Join us for a family workshop offered in conjunction with the exhibition Wynne Greenwood: “Kelly,” on view from September 16, 2015, to January 10, 2016, in the Fifth Floor gallery. In “Kelly,” Greenwood premieres the complete, newly remastered, and recently re-performed archive of her performances as Tracy + the Plastics (1999–2006), in which she plays all three parts in an all-girl band. 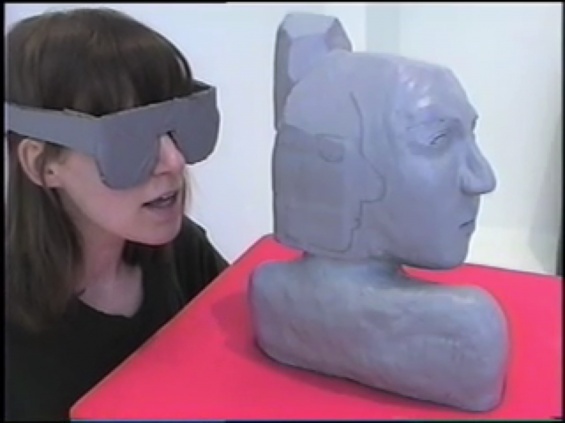 In recent video works also featured in the exhibition, Greenwood uses sculptural heads as characters, putting them into conversation with each other. From 10 a.m. to 12 p.m., create your own life-size head using foil, tape, balloons, paper bags, and other decorative materials. Participants will invent their own characters and then give voice to the new bodiless “cast members” of their own performance. Support for Wynne Greenwood: “Kelly” can be viewed here. This program is also made possible, in part, by the New York City Department of Cultural Affairs and the New York State Council on the Arts. Additional support is provided by the Bertha and Isaac Liberman Foundation, the May and Samuel Rudin Family Foundation, and the TD Charitable Foundation.